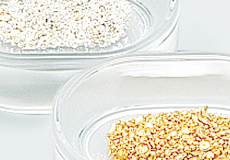 Tanaka Precious Metals Group, an expert on precious metals, recommends the use of "low precious metal materials" to reduce the use of or as a replacement for precious metals depending on the usage objective. Effective use of precious metals, which are valuable resources, enables companies to achieve low costs and highly productive processes. We provide comprehensive support services that cover everything from recovery and refining to remanufacture of precious metals. In other words, we recover precious metals from the scrap metal generated by manufacturing processes and waste products that have reached the end of their product life cycles, then return these recovered metals to the market. After consulting with you regarding your situation, we will recommend an appropriate service in consideration of the total process, from the product development phase to the recycling after product disposal. We support a variety of forms, including scrap metal generated from manufacturing processes, waste products that have reached the end of their product life cycles, and other solid items as well as liquids such as waste plating solutions containing precious metals. We also offer precious metal recovery systems by which the concentration of precious metals in waste solutions can be increased in order to reduce related transportation costs. We provide additional services including precision cleaning of vapor deposition and recycling of masking jigs. Sophisticated analytical skills are necessary to extract as many precious metals as possible. Low extraction rates greatly affect the actual amount of bullion recovered from precious metals. Among the five accredited Good Delivery Referees in the world, Tanaka Precious Metals Group is the only one in Japan, and our high-level analytical skills allow us to assess gold and silver melting technologies as well as the analytical skills of all accredited gold and silver refiners. On this basis we appropriately evaluate recovered materials. We can buy back recovered bullion at the prevailing daily precious metal market rate or return the physical bullion. We can also deliver the bullion as a new precious metal product (through recycling). Although there is a spread between sale and purchase prices in the precious metals market, you need not worry about such spreads during account settlement if recycling as you receive the bullion as a new product. In this manner, recycling is advantageous in terms of cash flow as no account settlement occurs.